Amateur Apple Breeding Video Series Launched! Yay! The apple breeding video series is off the ground! I really wanted to get it launched this year because I made a lot of pollinations this time around, and I'm not sure how many more years I'll be doing it. The first two videos are published . 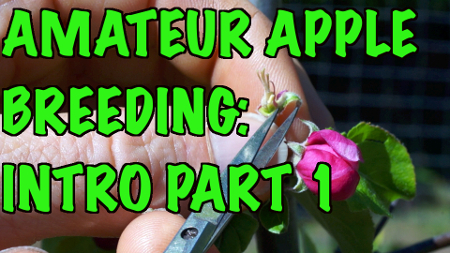 They are basically the same video in two parts, of me talking about why I'm breeding apples and basically why I think more people should breed plants, apple breeding history, along with some gentle ranting (only had to bleep out one %$#*& word! Pat me on the head). The next videos will be thoughts on selecting parents and then onto the fun part, the first how to segment which is on pollination. The pollination segment is mostly done, and I think it really turned out beautifully with my new drastically improved video capabilities. The concept of this series is to follow the entire breeding process starting from pollination, for many years onward, until those specific crosses bear fruit, and likely beyond that as the fruit is assessed over a number of years to see if it is worth naming and propagating. Also, we'll be following my progress with the whole project which is around 4 years in right now. I made my first pollinations in spring 2011, so I may get lucky and have some fruit as early as next year. One of my first seedlings is actually fruiting now, but it is just an open pollinated seedling of Wickson from my friends at The Apple Farm near here, so the pollen parent of that one is unknown. This link is to the playlist into which all the videos in this series will be dropped. Posted on May 10, 2015 by Steven Edholm and filed under Apples, Food and Drink Making, Food Trees Fruits and Nuts and tagged apple breeding apples fruit orchards plant breeding pollination.